I didn't intend for this to be the first post of the new year, but you have to start somewhere, right? I'll try to get my thoughts about the past and new year organized and published in short order, so stay tuned for that. 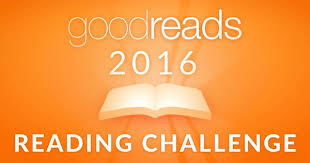 2016 marked my first participation in the annual Goodreads Reading Challenge. Using the second half of my statistics from 2015, I settled on a goal of reading 50 books in 2016. It felt like this would, in fact, be a challenge, that I would have to dedicate some time and effort into actually meeting the challenge. I felt that, should I succeed, I would feel a sense of accomplishment in addition to reaping the rewards of expanding my mind by sharing in the knowledge and artistry expressed in at least 50 books. I finished reading 65 books this year. I not only met my goal, but exceeded it by 15 books. Some of those books were short stories, but even without those few, the number of full-sized novels was still over 50. For those of you that don't want to do the math yourself, the mean book length was 378 pages. For further reference, the median length was 352 pages. This shortest book was actually just a short story; I probably shouldn't have tracked it on Goodreads. The next two smallest books I read were The Sleeper and the Spindle (by Neil Gaiman, 72 pages) and The Road Not Taken and Other Poems (by Robert Frost, 81 pages). On the longer side, I finished three books that were over 700 pages and four more that were 600+ pages. 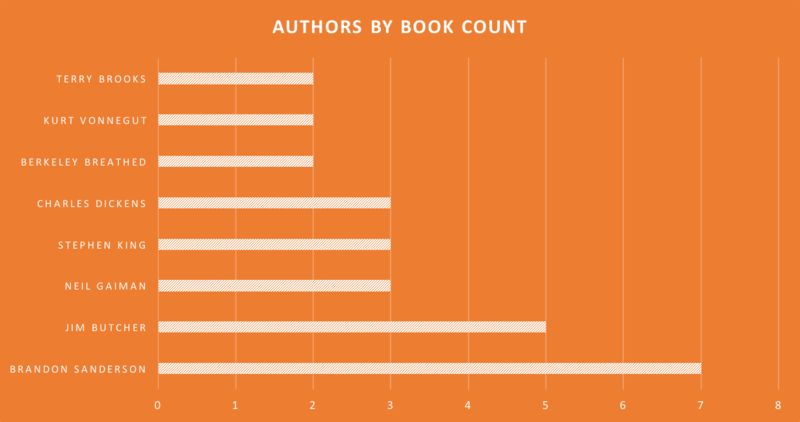 This was an interesting statistic offered by Goodreads. I, along with almost 1.9 million other people, read The Alchemist this year. By the way, if you haven't read it, you should. It's a quick read (under 200 pages), and let's face it: 1.9 million people can't all be wrong, can they? The least popular book I read was The Original: The Trials of Sarah Larkin, by Claudia Christian. I actually picked it up a couple of years ago from her website, with the proceeds from the sale going to the Three C Foundation. It was an interesting glimpse into the process of making films as well as a fanciful adventures of a superhuman heroine. You should pick up a copy if that sounds like it might float your boat. Now for the things that Goodreads didn't surface. You know what that means -- orange graphs! This graph surprised me a bit. 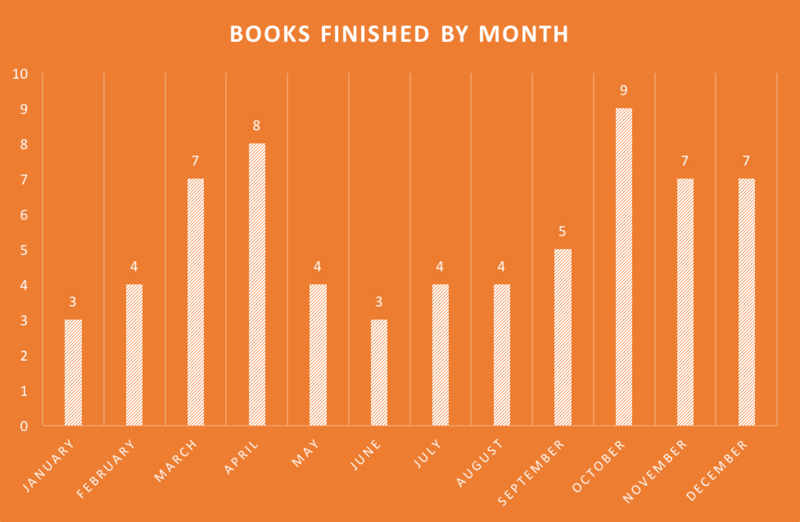 I finished fewer books over the summer than any other season. Next year, I think I'll include page counts instead of just book counts here. For example, I read 3055 pages in October, then followed that up with 2007 pages in November while writing 50,000 words of my own for NaNoWriMo. I must not have slept much in November. The shortest months on the graph were 1121 and 1328 pages for January and June, respectively. My most popular author this year was Brandon Sanderson. Jim Butcher was second, with honorable mentions for Neil Gaiman, Stephen King, and Charles Dickens (although, again, only one Dickens novel this year, along with two short stories). The big surprise in this list is Berkeley Breathed. Bloom County is a thing again, and with that came some collections for his other work. I procured two of them (one reviewed here). I hope more of these are forthcoming, because they are fantastic! I didn't do a genre breakdown this year, but you can guess from the authors above that most of it was sci fi and fantasy, with some thriller and classic fiction thrown in for good measure. If you're really interested, here's the link to the Goodreads summary.